I've been driving nearly 20 years now. I've been in two car accidents. I've gotten one speeding ticket (last week). I've been through five cars, none of which by the way, were built after the year 2000. Driving is a huge responsibility. You have lives in your hands. Not just yours and your passenger's lives, but the lives of those around you. When I think back upon what a selfish little turd-bucket I was at 16, I am remarkably surprised that my parents helped me get a car. Granted it wasn't a car, it was tank. It was a 1966 Chevy Impala. That is not actually my Impala. 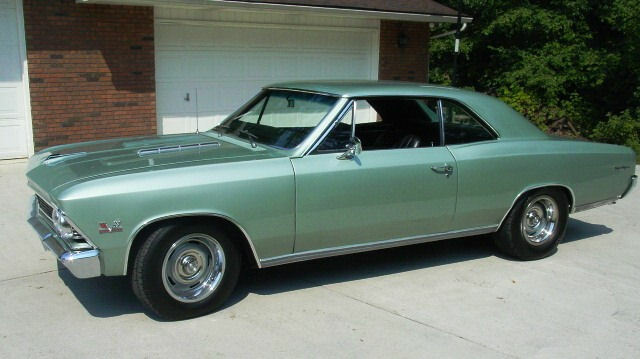 My Impala had many more colors than the beautiful metallic green you see in this picture. It also had some matte brown and red worked intermittently into the peeling paint. The interior was rough and torn. When we bough it, the carburetor had a birds nest in it. My mom, my dad, and I paid $700 dollars, split equally three ways, for that car. I loved it... for about a month. I grew up in a pretty affluent area. My family, while not poor, was not affluent. I'm not complaining. I didn't want for much, and my parents made a lot of sacrifices to give my sister and I a good life. But when I pulled my 31-year-old bucket of rust into the high school parking lot and parked it next to brand new Jeep Cherokees and Volkswagen Jettas, the coolness I thought I would have by owning a "classic" was quickly replaced with embarrassment. So I did what any teenager does when he feels discomfort. I complained. I lamented my lumbering beast. And yet, it got me where I was going. and my parents felt safe knowing that I was in a car that wouldn't go above 60 miles per hour without shaking like the Enterprise Pushing Warp 7. I only took it on the freeway once, and that was enough for me. It got me to school and back, and up the canyon to go work and go skiing. Automobile accidents kill more teenagers than anything else in America. Driving on under-inflated tires or tires with poor tread can be hazardous; 12 percent of the 2.2 million accidents involving inexperienced drivers are attributed to under-inflated or worn tires. Many of these accidents are preventable by paying attention to tire pressure and tread depth. Teach kids how to use a tire gauge and check tire tread depth, and have them check each measurement every month. That old car got me up and down the canyon for two years before it finally died. I sold it for $300. And while I never felt as cool driving it as I thought I would driving a classic Impala, I always felt safe. When it comes time to help my kids get their first car in a little over a decade, I hope they feel the same way.